The former factory – which also served as a warehouse for flour and a residence for the family that owns it, has seen a refreshing transformation with the addition of an eight-storey industrial building behind its distinctive three-storey conserved façade. 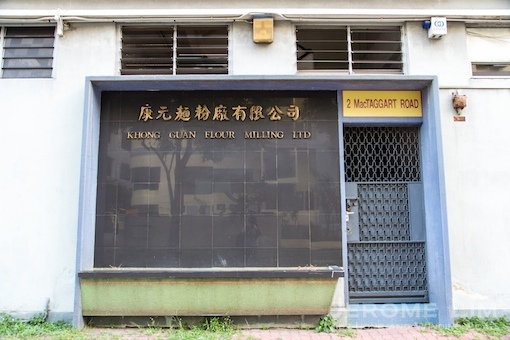 The design of the quite un-industrial looking new extension seems to have been undertaken by Meta Studio (see: http://meta-current.strikingly.com/#khong-guan-flour-milling-ltd and https://www.facebook.com/meta.architecture/posts/777289939043015). The real story behind Old Changi Hospital, isn’t about what the place seems to have got an unfortunate reputation more recently for. 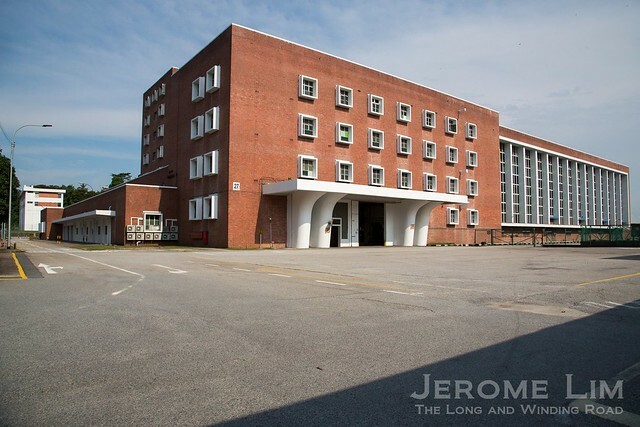 The former hospital, which has its roots in the RAF Hospital set up after the war in 1947, is a place that many who were warded or who worked there remember with fondness. The hospital, with a reputation of being one of the best military medical facilities in the Far East, is also well remembered for the wonderful views its wards provided of the sea and that it was felt aided in rest and recovery. Members of the public got to learn about the background to the hospital and how some of the basis for the more recently circulated myths are quite clearly false during a visit to the site as part of the Discovering Singapore’s Best Kept Secrets series of State Property Visits organised with the support of the Singapore Land Authority. More on the visit and the series can also be found at the links below. Telok Ayer Street, a landing point for early immigrants in days when the sea washed up to it, is littered with the reminders of the forgotten days of adventure. The street is dotted with religious structures aplenty. Now reconstructions of the simple prayer houses put up by those whom came from distant lands so as to permit thanks to be offered to their gods for the safe passage, they offer insights into the origins of some of modern Singapore’s early settlers. A cluster of Chinese structures from the mid 19th century, with two well ornamented pagodas, is found in the middle section of the street. 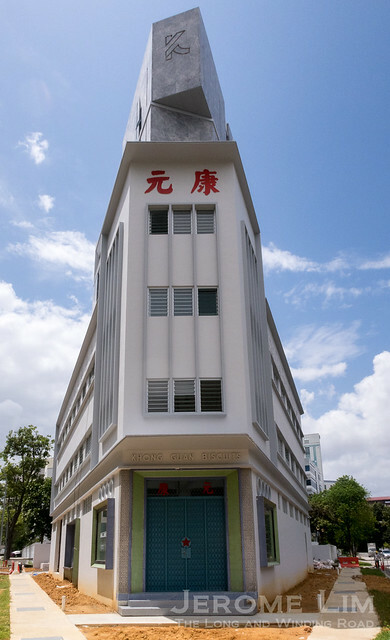 The structures, which display the distinctive Minnan style of architecture, tell us of two waves of Hokkien settlers not just to Singapore but also to the region. One of the pagodas is the Chung-Wen pagoda. Built initially for the worship of the god of literature, and used later as a school, it displays a little noticed but a rather interesting ornamental feature that was introduced to Minnan architecture during the Tang dynasty that takes the form of craved wooden figures of men with distinctively non-Chinese facial features dressed in colourful robes. The carved figures, appended in a corbel like fashion to the junctions of the beams and columns supporting the topmost tier of the pagoda, appear to be propping the structure up. The pieces, of which eight are found on the pagoda, are referred to in a rather disparaging manner as “dim-witted foreigners” in the vernacular. They have no structural function and are apparently a fairly commonly used decorative element in Minnan architecture. Rather than being an attempt to belittle, they are thought instead to have been a commemoration of the efforts of non-native workmen during the Tang period. Now fronted by a recently planted grove of gelam or Eucalyptus trees of a type from which Kampong Gelam (or Glam) got its name, is a mosque with an untypical minaret built into its boundary wall, the Hajjah Fatimah Mosque. 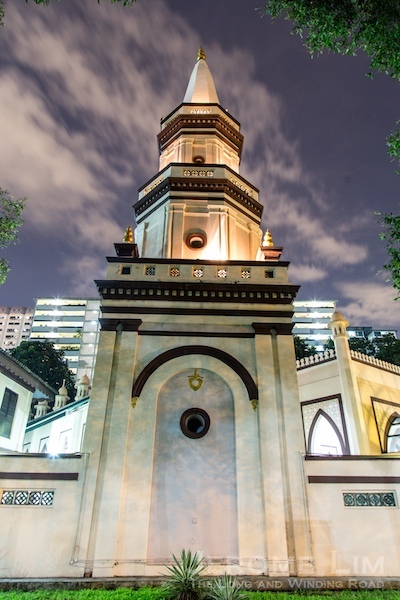 While the minaret’s claim to fame may be its tilt of 6 degrees – for which it is known as the “Leaning Tower of Singapore”, what seems more noticeable is the minaret’s resemblance to a church’s steeple. Strange as it may sound, it may actually have been the steeple of the original St. Andrew’s Church (now the Cathedral) that served as an inspiration. 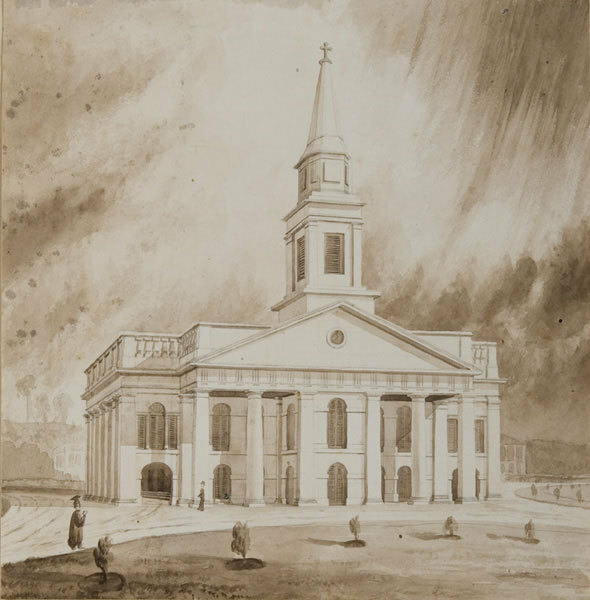 The church got its steeple in 1842, just a few years before the mosque was built. Now stabilised, the tilt of the minaret has been attributed to the settlement of the less compact structure of the hand-made bricks employed in its construction. The mosque finds itself in an odd position as a shophouse-lined road, Java Road, once ran along its walls. More photographs of the mosque and its unique minaret can be found at this link. Close-up of characters carved on the table. The Chinese characters ‘牛車水’ indicate that there were furniture craftsmen present in Singapore at a time when a lot of such commissioned work would have been carried out in China. The Mun San Fook Tuck Chee temple has its roots in the Cantonese and Hakka coolie community who settled around the banks of the Kallang River in the mid-1800s. Many in the community found work in the brick kilns near the village of Sar Kong (or Sand Ridge) and helped established the temple in the 1860s. The term “Mun San” found in the temple’s name, is thought to be a corruption of the Malay word bangsal or shed or workshop and points to the area’s industrial origins. The temple, which moved to its current premises in the early 1900s, is also a rare example of Cantonese style religious architecture in Singapore. What is perhaps more interestingly, is its furniture. A table used in the temple has the words “牛車水” carved into it, as a mark of its origin. “牛車水”, or ngau-che-shui as it would have been pronounced in Cantonese, translates literally to “Ox-Cart Water” and means “Bullock Water Cart”. This of course is a local reference to what we know today as Chinatown. The table is rather unusual in the sense that such items were then more commonly imported from China and what it does show is that wood craftsmen were then already present in Singapore’s Chinatown. Keramat Bukit Kasita on the slopes of Bukit Purmei, surrounded by block of HDB flats, is quite a curious sight. The old cemetery, with walls that give it an appearance of a fortified compound, has graves dressed both in the yellow of Malay royalty and green of holy men. Although it is quite unlikely, there are those who believe that the graveyard dates back to the 16th century. Even less likely is the claim that one of the graves purportedly belongs to “Sultan Iskandar Shah”. What seems evident however, is that the oldest tomb goes back to 1721, which is well before Raffles and the British arrived. The cemetery is also known to be the burial place of Sultan Abdul Rahman Muazzam Shah II, who was the very last sultan of Riau-Lingga, the Dutch influenced remnant of the once great Johor-Riau-Lingga empire. Uncooperative, Abdul Rahman II was driven out by the Dutch in 1911 and died a pauper in Singapore in 1930. Several of his descendants are also buried in the cemetery. 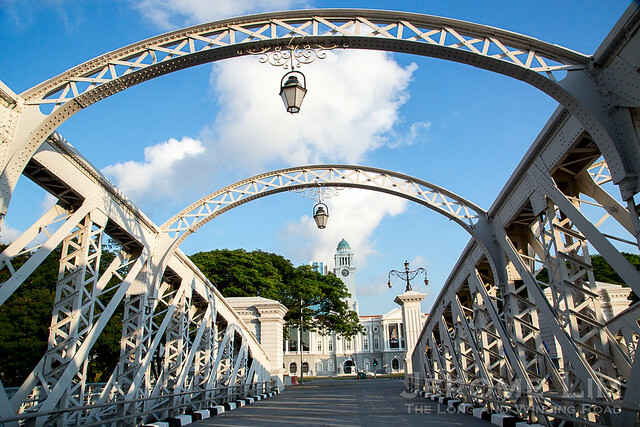 More at : A vestige of 16th Century Singapura? The Riau-Lingga sultanate was formed in the wake of the death of Sultan Mahmud Shah III – the last ruler of the once great Johor-Riau-Lingga Sultanate. Supported by the Dutch, the half-brother of the would be Sultan Hussein Shah of Singapore – Abdul Rahman (I) was installed as its sultan; a move that would be cemented by the Anglo-Dutch Treaty of 1824. The sultanate would see five sultans reign before it was dissolved by the Dutch in 1911. Emily Hill, a villa that dates back to the end of the 19th century, has had quite an eventful past. It has seen its ownership passed from the hands of the Sultan of Siak, first to a dentist and then to the Department of Social Welfare and its occupants include Managing Directors of a trading firm, dentists, the Consul-General of Japan and former prostitutes. 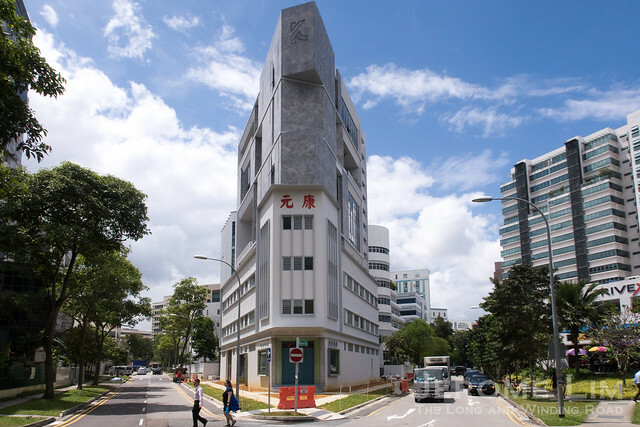 In more recent times, the National Arts Council has taken over and it has been used as an arts school as well as a venue for the arts. With the clutter that has been added to the area in the last 30 to 40 years, it is hard now to imagine that the house actually occupied a prominent position overlooking Middle Road. The road was the heart of a sizeable Japanese community in the early part of the 20th century, and was known as Chuo Dori (or Central Street) to the Japanese. Because of its position, it was chosen by an increasingly militant Japan to serve as a focal point for the community here as the office of its Consul-General in 1939. As the Japanese Consulate, it flew the flag of the rising sun from a position that was almost as lofty as Government House, perched atop nearby Mount Caroline. This continued until 1941 when the Japanese were expelled from Singapore. Another aspect of the house that few seem to know about, was the misfortune that befell several of its early occupants in the form of a spate of premature deaths in the 1890s. One unfortunate victim was on of the Katz Brothers’s MDs who took up residence there, the 45 year old Mr Heinrich Bock. His death, from a fall off a balcony on 31 May 1896, occurred in rather mysterious circumstances and was ruled by the coroner to be due to “suicide whilst temporarily insane”. Middle Road when it would have been referred to as Chuo Dori in the 1930s. Osborne House, the Japanese Consulate from 1939 to 1941 can be seen atop Mount Emily, beyond at the northwest end of the street. Built in 1912, the 3-storey rectory of St. Joseph’s Church, wears the appearance described as Portuguese Baroque. Intended to provide a parish hall and well as accommodation for the church’s clergymen, the house also has a room on its second floor and a small chapel on the third, reserved for the Roman Catholic Bishop of Macau. The church’s origins was in the Portuguese Mission. Rather uniquely in Singapore, it was a parish first of the diocese of Goa and later of Macau – both of which were Portuguese colonies. As such, the Bishop of Macau, visited regularly as the head of the diocese and this made it a palace of sorts for the Macanese Primate until the church’s links with Macau ceased in 1999 with the former colony’s transfer to China (the anticipation of Macau’s transfer to China saw St. Joseph’s Church transferred to the Archdiocese of Singapore in 1981, although the Bishop of Macau continued to appoint its priests until 1999). The Aljunied al-Islamiah Cemetery, is one of two old Muslim cemeteries from the 19th century that straddle “Grave Road” or Jalan Kubor in Kampong Gelam. It’s links go back to the prominent Yemeni-Arab Aljunied family with its patriarch, Syed Omar Ali having been buried on the grounds, which he bought and donated to the community as a burial ground, in 1852. The cemetery is also associated with an incident in December 1972 during which two gunmen at the top of Singapore’s most wanted list, who were brothers, took their own lives after being cornered by the police. This came at a time when gun crime was not uncommon in Singapore and when several gunmen were on the loose. The two brothers involved in this case, Abdul and Mustapha Wahab, were especially daring and trigger-happy and the incident brought to a one-and-a-half month reign of terror to a close. More on this incident can be found in a previous post: When gunmen roamed the streets of Singapore: a showdown at Jalan Kubor. 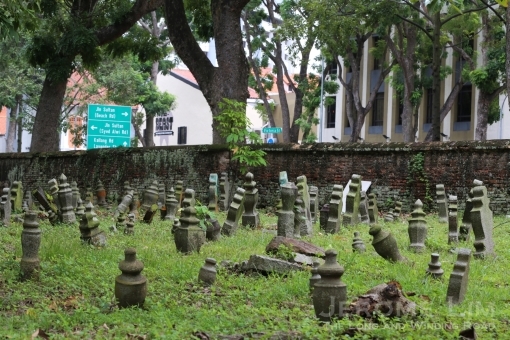 With graves that date back to 1889, the Japanese Cemetery in Chuan Hoe Avenue counts as one of the oldest un-exhumed non-Muslim burial sites in Singapore. Established by Japanese rubber plantation owners who were also brothel keepers to allow hundreds of karayuki-san (women who came over from impoverished parts of Japan to work in the vice trade in the late 1800s and into the early 1900s), the cemetery has not just the simple headstones marking where these unfortunate women are buried but also the graves of several interesting characters. A charnel containing part of the remains of Singapore’s first Japanese resident, Yamamoto Otokichi or John M. Ottoson, is one. Otokichi had quite an eventful life. He survived a 14 month long ordeal in a drifting wreck of a ship to become the first translator of the bible into Japanese and settled eventually in Singapore. 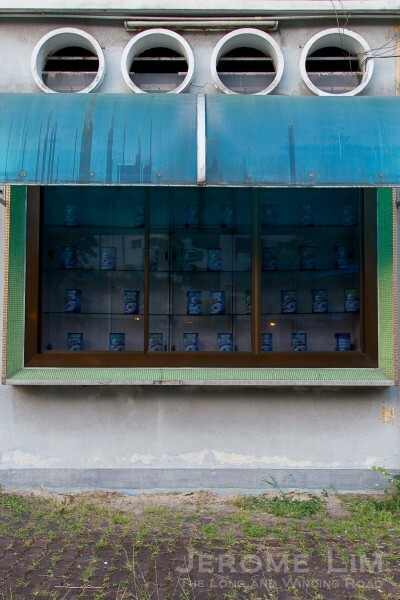 The cemetery is also linked somehow to Singapore’s darkest of days. Besides being where Field Marshal Count Hisaichi Terauchi, the Supreme Commander of Southern Command of the Japanese Imperial Army during the war, was first buried; the cemetery is also where a grave containing the ashes of 10,000 Japanese soldiers who fell during the war in the Pacific is found. The ashes were moved to the site after the Japanese ritually destroyed a war memorial erected at the top of Bukit Batok at which the ashes were originally placed, the Syonan Chureito, in the days leading up to their surrender. More on the cemetery at : Voices from a forgotten past. Now occupied by Objectifs, visual arts centre, the oldest building now on Middle Road has distinctively church-like features. Built in the 1870s, it originally housed a Christian Institute before turning into a church, the “Malay Church”, from 1885 to 1929. It has for the longest of time however not been used as a church, housing a restaurant during the war before being used from the 1950s to the 1980s as – of all things – a motor vehicle workshop by the name of Sin Sin! Anderson Bridge, completed in 1910 so that Cavenagh Bridge could be replaced, seems to have had quite a gruesome past. Known as the “Bridge of Death” in the 1950s for the spate of deaths from accidents involving motorcyclists, it was also one of several locations at which the heads of beheaded criminals were put on display in the early days of the Japanese Occupation to instill fear in the general population. The bridge also became a tomb for over two decades from the mid-1960s to the late 1980s, without anyone knowing. The skeleton of a man, Mr Ong Choon Lim, was discovered by a worker carrying out maintenance in February 1987. Ong, who would have been in his 50s when he died, had last been seen alive by members of his family in 1960. The skeleton was found with two rings, a watch, $9 in currency notes issued prior to 1967, an identity card issued in 1948 and a certificate issued in July 1961. Ong was thought to have died sometime in between 1962 and 1967, which meant that his remains would have lain undiscovered for over 20 years. The fire dragon of Sar Kong came to life last night, making its way in a dizzying dance around the area of its lair at the Mun San Fook Tuck Chee temple. Last night’s dance of the fire dragon. The dance of the dragon has its origins in Guangdong, from where many came from to work in the area’s brick kilns in the mid-1800s. The dance, rarely seen in a Singapore in which tradition has become an inconvenience, came at the close of the temple’s 150th Anniversary celebrations. The celebrations, held over a three day period, also saw a book on the temple’s history being launched. An exhibition on the history of the area is also being held in conjunction with this, which will run until 14 September 2016. A book on the temple and the community’s history, A Kampong and its Temple, was launched. Minister, Prime Minister’s Office, Chan Chun Sing – a former resident of the area, being shown a model of the Sar Kong village area at the exhibition. The parade of the straw dragon through the streets, is also thought to help dissipate anger caused by the disturbance of the land in the area of the temple being felt by the temple’s deities. The area, is once again in the midst of change – with a huge condominium development, Urban Oasis, just next door. The site of the development, incidentally, is linked to the current outbreak of the mosquito borne Zika virus in Singapore. Lit joss sticks being placed on the straw dragon’s body prior to the dance. There may perhaps be anger felt at the uncertainty for the future that temple itself faces. The land on which it sits on has long since been acquired for redevelopment by the Housing and Development Board (HDB) and the temple operates on it only through a Temporary Occupation License. The parcel of land it sits on is one shared with HDB flats that were taken back by the HDB under the Selective En-bloc Redevelopment Scheme (SERS) in the second half of the 2000s and it is left to be seen if the temple will be allowed to continue on the site when the area is eventually redeveloped. The dragon offering respects to the altar prior to its dance. The temple, Mun San Fook Tuck Chee (萬山福德祠), is thought to have its origins in the 1860s, serving a community of Cantonese and Hakka migrant workers employed by the area’s brick kilns, sawmills and sago making factories. The temple moved twice and came to its present site in 1901. The dance of the fire dragon that is associated with the temple, although long a practice in its place of origin, only came to the temple in the 1980s. The dragon used for the dance is the result of a painstaking process that involves the making of a core using rattan and the plaiting of straw over three months to make the dragon’s body. Lit joss sticks are placed on the body prior to the dance and traditionally, the dragon would be left to burn to allow it to ascend to the heavens.